The tropical fruit mangosteen is rich in antioxidants and micronutrients and is sold at Asian food stores and markets. It grows abundantly in Thailand. It's the size of a tennis ball, with a firm shell that is deep purple. It is found abundantly in Thailand. Good mangosteens have healthy-looking green caps and a nice glossy sheen on their outer skins. The fruit should be firm and have no cracks. Make sure the fruit is bug-free. Do not buy fruit that has hardened beads of yellow resin on the outer rinds as those often contain sections that have suffered from resin seepage. To open your mangosteen, hold it firmly on its side and make a cut with a serrated knife. The older the mangosteen, the harder the skin will be (a sawing action may be needed). Cut shallowly all around the circumference, about 1/4 to 1/3 inch deep, just enough to create an opening for your fingers to get in. You do not want to cut all the way through to the middle. If you do not have a knife, you can hold the mangosteen between your two palms and squeeze your hands to crush the purple shells. Once the shells are cracked, you should be able to peel off the shells. This way is messier and may result in the internal sections getting crushed, releasing some of the juice. Once you have cut around the entire fruit, try prying the fruit open with your fingers or gently pulling it apart each half with your hands, similar to opening an avocado. If you cannot do this, or cannot see the white of the fruit, you have not cut deeply enough. Pull away the skin to reveal the white mangosteen fruit. If a little of the purple shell of the mangosteen sticks to the fruit, do not be tempted to remove it. This deep purple skin is full of antioxidants and valuable micronutrients. Good mangosteens have sections that are opaque white, firm, and not translucent or yellowish. Mangosteen fruit looks similar to an orange since it has internal sections. 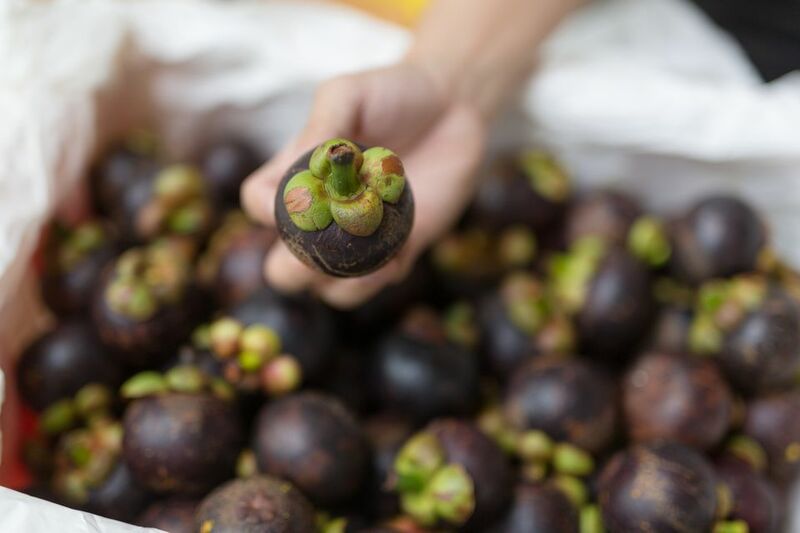 Mangosteen has a sweet flavor and very soft texture. The seeds are soft and edible and do not need to be removed. In some cases, you might not even notice the seeds are there. Other people choose not to eat the seeds. They may be hard and bitter, so you might want to discard them in that case. Mangosteen can be eaten as is or combined with other fruits in a fresh fruit salad. Some people juice them, shell and all. Mangosteen can be used for ice creams and sorbets, and many other desserts, such as mangosteen clafouti. It can also be used on top of an Asian pudding, such as Thai tapioca pudding. Also, Mangosteen can be incorporated into savory dishes, adding a sweet layer of flavor to a dish.